What are the best bass fishing lures to use? When? Where? And how we should use them? Many bass fishermen head out to their favorite freshwater fishing spot and are confident that they're going to catch a ton of largemouth bass. Well, to their disappointment, it doesn't always work out that way. Has that happened to you?... Have you wondered what you must be doing wrong? Or just chalk it up thinking that the fish aren't there or just not hungry enough to bite your bass fishing lures? Actually, water clarity - light to dark - is a key factor to consider when deciding which are the best bass fishing lures to use to help locate fish. Largemouth bass tend to move out deeper in clearer water, and will often be found up shallower in dingier water conditions. Check out Bass Pro Shops online to find today's latest and greatest bass fishing lures and loads of your favorite gear and tackle. Flipping in and around cover with fast and erratic jerking retrieves. Jerkbaits: Just above underwater vegetation. 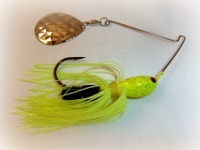 Jerkbaits are also a great search style lure for locating fish, especially in colder water temperatures. Tubes: Rock piles, humps, and any type of deeper cover. Topwaters: Early in the day, target extended visible points, near docks, boathouses, and visible cover. Numerous casts concentrating mainly on multiple falls, erratic retrieves, and bumping cover. Jigs: Ledges and drop offs. Stick Worms: Brush, edges of vegetation, underwater ridges. Crankbaits: Points, humps, and outside edges of weedlines. Hit cover or bottom to stir up commotion or noise, and eratically ripping through underwater grass. Spoons: Deeper break lines with structure. Crankbaits: Backs of creeks, bends, points. Flip or crank through cover thoroughly with repeated casts. Bulky Jigs: Punch through mats, vegetation and heavy cover. Creature Baits: Use big profile plastic creature baits in heavy vegetation and cover. Crankbaits: Shallow stumps, laydowns, or shoreline vegetation. Use bulky spinnerbaits with big Colorado blades, large chatter baits, or other big profile bass lures that provide a lot of noise and vibration to help attract the fish. Flip into cover and near the water's surface with a medium retrieve. Visible bushes and brush, laydowns, grass, docks, boathouses. Does darker water mean shallow bass? The darker and dingier the water color is, then the higher up in the water column that largemouth bass are more likely to be found. Therefore, a larger profile lure creating more commotion is often required to help attract them to your presentation. Since the fish shall be up shallower in the water column, anglers walking the bank or shorelines are able to have some excellent success catching quality trophy largemouth bass. And boat fishermen shall be able to position themselves nearly right on top of the fish since they won't be as spooked. Where to find largemouth bass in clear water? The clearer the water visibility is, the further down and spookier the bass will generally be. In this case, smaller and more realistic looking types of bass fishing baits should be presented. Longer casts with a little erratic jerking and popping may be necessary to entice fish to strike. Find out what the top 5 highest ranking bass fishing lures that bass angling enthusiasts use most often. My favorite online store to shop for the best bass fishing lures is Bass Pro Shops. They carry thousands of the top freshwater fishing gear, tackle and outdoor equipment... it's like being a kid in a candy store.